VAUGONDY - [Title page] Atlas Portatif, Universel. VAUGONDY, R. de - [Title page] Atlas Portatif, Universel. 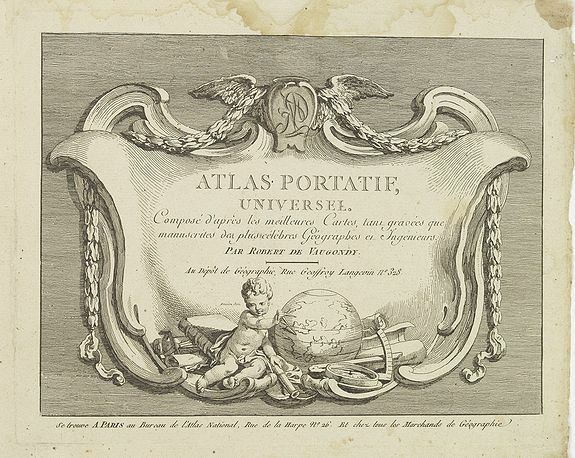 Title : [Title page] Atlas Portatif, Universel..
Map maker : VAUGONDY, R. de. Date : Paris, later than 1748. Size : 6.5 x 8.5 inches. / 16.5 x 21.6 cm. Description :Frontispiece from Robert de Vaugondy's "Atlas Portatif, Universel. Composé d'après les meilleures Cartes, tant gravées que manuscrites des plus célèbres Géographes et Ingénieurs". The title surmounts a putti sitting on geometrical and nautical instruments, beside a globe. The author's initials are on top. Pedley, Bel et utile, map 188, not mentioning this state. Condition : Very crisp and fine image. Some marginal water staining. Paper slightly age toned. Minor faint brown spot in the right hand side. Good condition.